Dr. Edward J. Clynch is a Professor of Political Science and Public Administration. He joined the Mississippi State faculty in 1981 and also taught at Kansas State University and the University of New Orleans. A native of Indiana, Dr. Clynch earned his B.A. degree from Hillsdale College, his M.A. from Ball State University and his Ph.D. from Purdue University. He specializes in state budgeting. During his career at Mississippi State Dr. Clynch held several offices in professional organizations relating to public administration. He served as president of the Mississippi Chapter of the American Society for Public Administration and as Chair of the national ASPA section on Public Administration Education. Dr. Clynch also served as a member of the National Association of Public Affairs and Administration's Executive Council and as a member of NASPAA'S national accrediting board, The Commission on Peer Review and Accreditation. He also chaired over twenty accreditation site visits for NASPAA. At Mississippi State he served as a department head and graduate coordination for several years and as a member of the University Planning and Priorities Committee.r. Clynch has authored over 30 professional publications, many dealing with state budgeting generally and with state budgeting in Mississippi. He also co-edited two scholarly books on state budgeting. Dr. Clynch is a member of Who's Who in America. He retired in 2006 and may be reached by email at: ejc1@msstate.edu. Jerry Emison is a Professor Emeritus of Political Science and Public Administration at Mississippi State University and a retired Senior Executive Service appointee at EPA. At MSU he taught city planning, public management and environmental policy. His research interests concern the effectiveness of public environmental institutions, professionalism in city planning and engineering, and environmental consequences of growth management. He is the author or co-editor of three books: Practical Program Evaluations: Getting from Ideas to Outcomes (CQ Press 2006), Speaking Green with a Southern Accent (Lexington Press 2010) and True Green: Executive Effectiveness in the U.S. Environmental Protection Agency (Lexington Press 2012). In addition he has authored over 30 professional journal articles/book chapters and 60 academic conference papers. He was chosen by students to be the departmental Professor of the Year in 2006, 2008, 2012, 2015 and 2017. He served as a Fulbright Specialist to Cambodia in 2015. Prior to joining MSU Jerry served in a number of Senior Executive Service positions with the U.S. Environmental Protection Agency as the Director of the Office of Air Quality Planning and Standards, as the Deputy Regional Administrator in Seattle and as the Director of the Program Evaluation Division in Washington, DC. Among his activities he was an architect of the Clean Air Act of 1990, supervised EPA’s clean up responsibilities at the Hanford Nuclear Reservation and managed the Spotted Owl controversy for EPA. He was a member of EPA’s Quality Improvement Board and personally trained in TQM about 25% of EPA’s senior executives. As a result of his work at EPA he received the presidential rank designation for meritorious senior executive service. He received his Ph.D. in City and Regional Planning from the University of North Carolina at Chapel Hill. He also holds additional graduate degrees in Political Science and Engineering Management. His undergraduate work was in Civil Engineering at Vanderbilt University, and was followed by service in the Seabees in Viet Nam. He is a registered professional engineer, a board-certified environmental engineer of the American Academy of Environmental Engineers and a Fellow of the American Institute of Certified Planners. He has been married to Donna Kay Harrison for over forty years. In his spare time Jerry competes in triathlons. His other hobbies are conducting charity auctions, yoga, and reading history and philosophy. In his civic life he has served as chair, vice-chair or member of municipal land use, planning/zoning and open space commissions as well as serving on a number of special purpose task forces at the local government level; he most recently was chairman of the City of Starkville Planning and Zoning Commission. 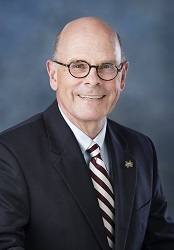 In 2013-2014 he served as the President of the Faculty Senate at Mississippi State University. Diane E. Wall joined the Department of Political Science in 1983 after receiving her Ph.D. from Michigan State University. Her areas of specialization are public law and administrative law. Diane is an Associate Professor Emerita in the political science and public administration department and Shacklous Honors College Faculty at Mississippi State University (MSU). In 1994 Diane was awarded the MSU "Outstanding Woman Teaching Faculty Award". The National Academic Advising Association and ACT awarded Diane the 1995 Outstanding Advisor Award. She received the MSU Alumni Association's "Faculty Recognition Award - Upper Division" in 2000 and her department's "Outstanding Professor Award" in 2005. In 2007 Diane was awarded the MSU "Irvin Atly Jefcoat Excellence in Advising Award". Diane is listed in various Who's Who publications including Who's Who in the World. Her service activities included being a gubernatorial appointee to the Mississippi Task Force on Local Government Information System, Chair of the Pre-Law Advisors in the College, and the department's Undergraduate Coordinator. Diane has been an officer or a board member for several Mississippi State chapter organizations, including The Honor Society of Phi Kappa Phi. She was a member of various professional organizations, including the American Political Science Association, National Association of Women Judges, and American Society for Public Administration. Her main research was on the topic of gender differences in state Supreme Court justices' decision making. She was co-editor for the September, 2000, special issue of Southeastern Political Review on women in Southern United States politics. A book on Mississippi politics and government contains her chapter on Mississippi's legal system and she has the entry "Mississippi" in Legal Systems of the World: A Political, Social, and Cultural Encyclopedia.